Prostate cancer (PCa) is a major health problem, with over a million new cases and over 300 000 associated deaths estimated worldwide in 2012.1 An international randomised controlled trial showed that screening for prostate specific antigen (PSA) resulted in a 27% reduction in PCa mortality.2 Because of concerns over a high rate of false positive results, in addition to aggressive treatment of apparently indolent disease, however, many clinical guidelines do not endorse universal screening and instead stress the importance of taking into account individual patient risk factors to decide whether to screen.345 The goal is to avoid unnecessary screening while still identifying men at high risk for whom screening and early detection can reduce morbidity and mortality. We used data from 31 747 men of European ancestry from the international PRACTICAL consortium (http://practical.ccge.medschl.cam.ac.uk/) to develop a polygenic hazard score (PHS) for predicting age related risk of developing aggressive PCa. This is designed for use before the decision of whether to screen (for example, with PSA) by providing a risk stratification strategy to maximise screening efficiency. The hazard score was tested in data from an independent screening study (UK ProtecT12), with the hypothesis that it would be an indicator of a patient’s inherent genetic risk for developing PCa at various ages in his lifetime and thus could guide PSA screening. Concerns about overdiagnosis and overtreatment of indolent disease have influenced discussion of PCa screening, whereas there is consensus that aggressive cancer warrants treatment.1314 When possible, we therefore focus validation in this study on prediction of aggressive disease, defined as any tumour that would require radical treatment for a typical healthy man according to guidelines from the National Comprehensive Cancer Network (NCCN)—that is, not eligible for active surveillance.14 This includes cancers with any of Gleason score ≥7, stage T3-T4, PSA concentration ≥10 ng/mL, nodal metastasis, or distant metastasis. Stage T2 tumours were classified without a subcategory in our database, so a patient with low Gleason score and low PSA concentration but stage T2b or T2c would be considered low risk in this analysis even though NCCN guidelines would indicate treatment for intermediate risk; this was to ensure that no low risk tumours were included as cases of aggressive cancer. Some additional analyses used age of diagnosis of any PCa (rather than only aggressive PCa) as complementary information. Another secondary analysis tested prediction for “very aggressive disease,” defined as any of Gleason score ≥8, stage T3-4, positive nodes, or distant metastases. To develop the polygenic hazard score model, we obtained genotype and data on age from 21 studies from the PRACTICAL consortium (table A in appendix 1), representing 31 747 men (18 868 with any PCa, 10 635 with aggressive PCa, 5406 with very aggressive PCa, 12 879 controls) of genotypic European ancestry. Age was either at diagnosis or last follow-up (for controls). Genotyping, performed with a custom Illumina array (iCOGS), and quality control steps have been described previously.6 A total of 201 043 single nucleotide polymorphisms were available for analysis. We could not categorise cancer as aggressive or not in 4803 of the men with cancer because of incomplete data on staging; these were excluded from analyses of aggressive cancer. An independent study examined performance of the model. The validation set came from the ProtecT study, which screened 82 429 men with PSA testing and found 8891 men with PSA concentration over than the specified threshold of 3.0 ng/L or higher, 2896 of whom received a diagnosis of PCa.12 Among those individuals, we obtained data on genotype and age for 6411 men (1583 with any PCa, 632 with aggressive PCa, with 220 very aggressive PCa, 4828 controls). Staging data were available for all cases. This dataset was selected for validation because PSA results were also available for all participants at time of either diagnosis or interview. Further details in appendix 1. During model development, we excluded single nucleotide polymorphisms with call rates less than 95%. We imputed missing calls for the remaining polymorphisms with the mean genotype count for that allele across all participants. The polygenic hazard score was developed previously as a parsimonious survival analysis model to predict the time to event outcome (in this case, age of onset of PCa). It has been published elsewhere,15 and further details of application here are described in appendix 1. The score is defined as the vector product of a patient’s genotype (Xi) for n selected single nucleotide polymorphisms and the corresponding parameter estimates (i) from a Cox proportional hazards regression (see equation). Genetic prediction specifically for aggressive PCa has proved elusive, with most single nucleotide polymorphisms associated with aggressive disease also showing association with any PCa.16 Therefore, in the interest of maximising power to select polymorphisms associated with age of onset, we decided to initially include all cases from the development set (that is, any PCa) for generation of the model. We then tested an alternate strategy that limited generation to cases of aggressive cancer for comparison. The primary metric for validation in both instances remained prediction for aggressive cancer in the independent validation set. To verify whether the polygenic hazard score accurately predicts age at onset of aggressive PCa, we calculated the score for all patients in the validation set and tested it as the sole predictive variable in a Cox proportional hazards regression model for age of diagnosis. Patients in the validation set with a diagnosis of low risk disease (Gleason score ≤6, PSA concentration <10 ng/L, and stage T2N0M0 or lower) were censored at time of diagnosis, reflecting the fact that it is unknown if they would later receive a diagnosis of aggressive disease or at what age that might have occurred. Significance was set at α of 0.01 for this and all subsequent Cox models. As an indicator of effect size for the model, we calculated a hazard ratio comparing men with high scores (>98th centile) with those with average risk (30th-70th centile). All hazard ratios presented here refer to the same pattern: high versus average risk. Because of evidence that initially low risk disease often progresses to require treatment,171819 and because this might be particularly important for men with a diagnosis at a young age, we performed a secondary analogous analysis to test for prediction of age of diagnosis of any PCa. We did a secondary analysis for prediction of very aggressive disease. To further assess the clinical significance of the polygenic hazard score, we looked at the positive predictive value (PPV) of PSA testing within the validation set, with clinical diagnosis (including biopsy result) as the ideal. We posited that risk stratification by centiles of the score would reflect the underlying incidence of PCa and therefore also affect the positive predictive value of PSA testing. Details on the calculation of positive predictive value are in appendix 1. 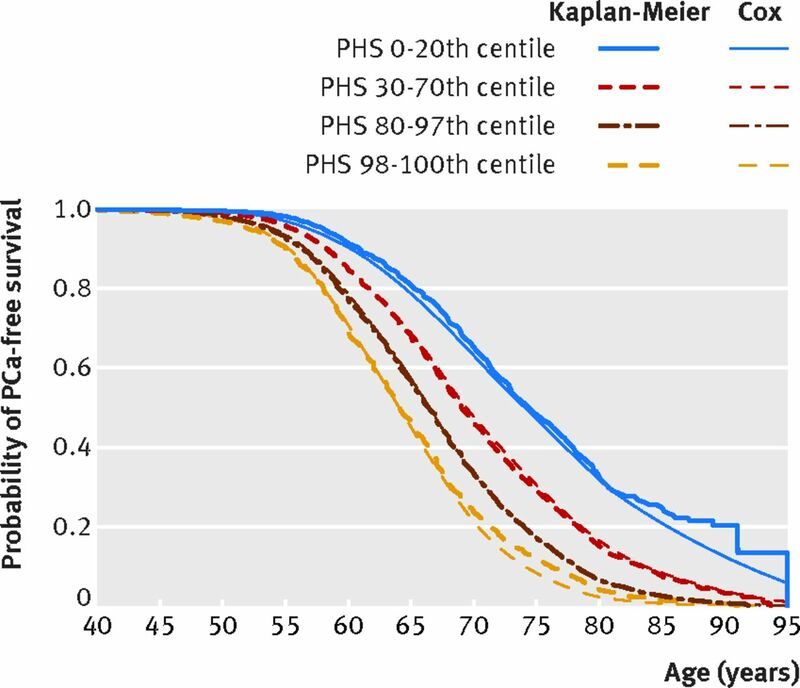 Categories of the score were designated by centile compared with the young healthy population within the development set—that is, those controls aged <70. All centiles reported in this manuscript refer to this population. One of the most important risk factors used currently for screening decisions is family history.3 We compared family history and polygenic hazard score for prediction of onset of aggressive PCa using the same Cox model approach as before, with the 5703 men (1405 with any PCa, 554 with aggressive PCa, 4298 controls) from men in the validation set with known family history status (none or one or more affected first degree relatives). Models were constructed with family history alone, hazard score alone, or with both. These were compared via log likelihood tests. No patients were directly involved in designing the research question or in conducting the research. A link to the published results will be posted on the PRACTICAL consortium website, and the respective principal investigators of each contributing study will be provided the results to disseminate to individual participants when possible. Of the 201 043 single nucleotide polymorphisms included in the dataset, 2415 were associated with increased risk of PCa in the trend test, with P<10−6. The stepwise regression framework then identified 54 of these polymorphisms that were incorporated into the Cox proportional hazards model (table B in appendix 1). The 54 parameter estimates (for the hazard of developing PCa) were combined with individual genotype to generate the polygenic hazard score. Figure 1 shows Kaplan-Meier and Cox regression estimates for the final model. The final model performed well for prediction of age at onset of aggressive PCa in the development set (z=37.5, P<10−16, hazard ratio 2.3, 95% confidence interval 2.2 to 2.4). We excluded only 43 polymorphisms (0.02%) for low call rate during model development and used imputation for missing calls for 0.4% of calls in the final model. Of the 6411 participants in the validation set, the median individual polymorphism call rate was 100%, with a minimum of 98%. In the independent validation set from the ProtecT study, a Cox proportional hazards model showed that the polygenic hazard score was a significant predictor of age at onset of aggressive PCa (z=11.2, P<10−16). Compared with average risk, the hazard ratio for men with a high score (>98th centile) was 2.9 (95% confidence interval 2.4 to 3.4). The score was also predictive of any PCa (z=15.4, P<10−16; hazard ratio 2.5, 2.2 to 2.8) and very aggressive PCa (z=6.8, P<10−11; 3.0, 2.2 to 4.0). An alternate model used only cases of aggressive PCa from the development set to select polymorphisms. Prediction for onset of aggressive PCa was still significant (z=9.4, P<10−16, 2.6; 2.1 to 3.1) but did not outperform the original model, so we used the original for all subsequent analyses as planned. As the polygenic hazard score was predictive of risk of PCa, we expected it to modulate the positive predictive value of PSA testing in the validation set. Indeed, the positive predictive value of PSA was lower among patients with a low score and higher among patients with progressively higher scores (fig 2). This pattern held for the positive predictive value for any PCa, as well (fig B in appendix 1). The Lorenz curve in figure C in appendix 1 shows the distribution of the polygenic hazard score among cases of aggressive PCa in the validation set. Patients with scores above the 50th centile accounted for 76% of cases of aggressive PCa, and the upper fifth accounted for 42%. With the subset of the validation set with known family history status (1405 cases, 4298 controls), we repeated the Cox test with adjustment for family history. Family history alone was not predictive of age of onset of aggressive PCa (z=0.9, P=0.37; hazard ratio 1.1, 95% confidence interval 0.9 to 1.4), though there was a trend toward prediction for any PCa (z=2.0, P=0.05; 1.2, 1.0 to 1.3). Inclusion of family history did not improve prediction over the polygenic hazard score alone for aggressive PCa (P=0.59) or any PCa (P=0.14), and the score remained predictive when adjusted for family history. Genetic information can guide the decision of whether an individual patient needs PCa screening.8 The polygenic hazard score described here represents a personalised genetic assessment of a man’s age related risk that could inform both whether and when to order screening tests. When applied to data from an independent clinical trial, the score was a highly significant predictor of age at diagnosis of aggressive PCa. Men in the top 2% of the score had a hazard ratio of 2.9 for aggressive PCa compared with men with average risk. As the score is representative of a man’s fixed genetic risk, it can be calculated once, long before onset of PCa, and substantially inform the decision of whether he should undergo PCa screening. Positive predictive value is directly dependent on prevalence, so if the polygenic hazard score predicts age of onset of PCa, the positive predictive value of PSA should vary with the score. Figure 2 shows that this was true in the validation set. Nearly a quarter of the positive PSA test results in men with a high score portended a diagnosis of aggressive PCa. The risk was much lower for men with low scores with a raised PSA concentration. The score is an indicator of the utility of PSA screening and could be influential in the decision whether to order a PSA test for a given patient. These results also add to existing data as further evidence that genetic features can predict risk of PCa.67811232425 Investigation into the genotypic features described here and elsewhere could give additional insight into biological rationales for the association with PCa. Family history of PCa is one of the most commonly used risk factors in clinic to determine screening decisions.3 Family history, however, was not predictive of age of onset of aggressive PCa in the validation set, and it did not improve prediction over the hazard score alone. This could reflect a lack of power to detect an association for family history in the relatively small validation set. A concern with PSA screening is overdiagnosis and overtreatment of indolent disease. As with other genetic prediction tools, the polygenic hazard score is not specific for aggressive PCa alone,16 though the hazard ratio was slightly higher for aggressive PCa than for any PCa. The problem of overdiagnosis is compounded by the observation that many men with an initial diagnosis of low risk disease later receive a diagnosis of aggressive disease.1719 Active surveillance is one answer to overtreatment that avoids up front treatment but still allows for monitoring for development of indications that treatment is necessary. Indeed, most tumours eventually require treatment,1718 and earlier treatment prevents development of metastatic disease.18 Hence, avoiding screening altogether in patients who might develop PCa at a young age does carry risk of considerable morbidity. The present results show that the polygenic hazard score can help to target screening efforts toward those men at highest risk of early onset PCa or aggressive PCa requiring treatment. As the score is predictive of aggressive PCa in general, it might also be useful for predicting outcomes of men with a diagnosis of low risk PCa in ProtecT. The clinical data necessary to answer this interesting question have not yet been made available to the PRACTICAL consortium, so it will have to be explored in future analyses. Previous studies have used GWAS-associated polymorphisms to predict risk of PCa with a case-control design.232425 Epidemiological data, however, show that risk of PCa is not a simple dichotomy of cases and controls but rather is highly dependent on increasing age. We therefore opted for a survival analysis approach optimised for genetic prediction of age of onset of PCa. The polygenic hazard score can then be used in clinical decisions, when age plays a critical role. If a man has a high risk of developing PCa at age 95, this is a different clinical situation from a man at high risk at age 55. A comparison of the polygenic hazard score with a traditional polygenic risk score is described in appendix 2. Other PCa risk calculators use clinical variables and are most useful for a man who might already have PCa.262728 PSA concentration is often included, meaning the decision of whether to screen has necessarily already been made when the tools are to be used. These are less useful for predicting his lifetime risk before he reaches an age at which he and his physician have to decide whether he should follow some programme of PCa screening. 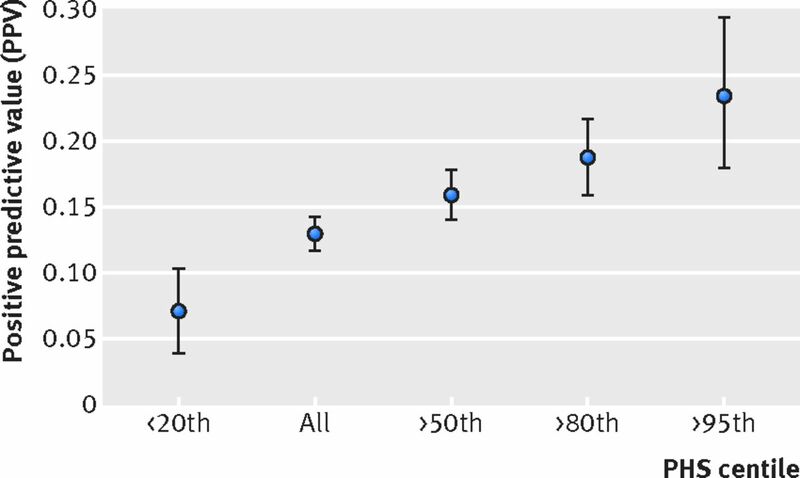 The risk stratification metric with best supportive evidence described in the literature is an early midlife PSA concentration measured at a relatively young age (for example, <50). While not currently recommended in many major clinical guidelines,345 early midlife PSA has been shown to be predictive of future risk of PCa and lethal PCa.22293031 One nested case-control study showed that just the top 10% of the distribution of concentrations of PSA in tests done in men aged under 50 accounted for 40% of cases of metastatic PCa.22 This has led to a recommendation to consider PSA testing as early as age 45 in men thought by their physician to be at high risk.32 A direct comparison of the polygenic hazard score and early midlife PSA for prediction of age at onset of aggressive PCa would be worthwhile. There might also be an advantage to combining the two predictors. Unfortunately, early midlife PSA concentration was not available in the datasets used in the present study so the question is left for future work. The development set was a heterogeneous composite of several studies of varied design (table A in appendix 1), which provides sufficient power to study single nucleotide polymorphisms with relatively small effect sizes but also raises the concern of undetected bias in a retrospective analysis. The validation set, however, came from an independent large prospective trial, and whatever problems might exist in the development set, the most pertinent question is whether the model allows useful predictions. The score was applied here to PSA screening alone. PSA is the most prevalent screening test currently for PCa, but the hazard score could also be expected to add value to other screening strategies, by predicting underlying risk of PCa for a given age and therefore influencing pretest probability (and, by extension, positive predictive value). This might include PSA velocity, PSA density, or some screening tool completely independent of PSA. The evidence presented here suggests that the polygenic hazard score can help a physician decide whether to order PSA, based on the pretest probability and positive predictive value of PSA for a given patient. Our study does not, however, deal with an alternate question: how the hazard score might compare to diagnostic tools (including risk calculators) that are part of the clinical investigations after a raised PSA concentration has been found. Adequate data are not available in the present dataset to answer this question, but it could be tried in future work as an additional application of the polygenic hazard score. Finally, ethnicity in this model was limited to European ancestry. Validation of the score in other ethnic groups—and, if necessary, custom models for each—is needed. We plan to investigate this important question. In conclusion, we describe here the development of a new polygenic hazard score for personalised genetic assessment of individual age associated risk of PCa. This score has been validated in an independent dataset, showing accurate prediction of onset of aggressive PCa. Moreover, the score can predict the utility of PSA testing for an individual man. This genetic risk model might play a role in guiding decisions about whether and when to screen for PCa. Investigation into the relation between the score and early midlife PSA testing is warranted. *Details of additional members from the Prostate Cancer Association Group to Investigate Cancer Associated Alterations in the Genome consortium (PRACTICAL, http://practical.ccge.medschl.cam.ac.uk/), acknowledgments, and funding are provided in appendix 2.
. A General Definition of the Lorenz Curve. Econometrica1971;39:1037-9doi:doi:10.2307/1909675.